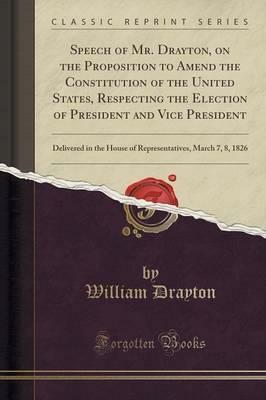 Excerpt from Speech of Mr. Drayton, on the Proposition to Amend the Constitution of the United States, Respecting the Election of President and Vice President: Delivered in the House of Representatives, March 7, 8, 1826 Compared with these results, the obstacles which the Constitution has interposed against cupidity and avarice are as dust in the balance indirect inﬂuence is guardo ed against whilst direct power is given. The by paths to the camp are strictly guarded, but the main avenue to jt is Open and unprotected. The outworks are vigilantly defended, whilst the citadel is ungarrispn ed and invites attack by the facility With which it may be carried. A British House of Commons in the 17th century, triumphed over the crown. The aristocracy, and the People; and erected a despotism on their ruins. About the Publisher Forgotten Books publishes hundreds of thousands of rare and classic books. Find more at www.forgottenbooks.com This book is a reproduction of an important historical work. Forgotten Books uses state-of-the-art technology to digitally reconstruct the work, preserving the original format whilst repairing imperfections present in the aged copy. In rare cases, an imperfection in the original, such as a blemish or missing page, may be replicated in our edition. We do, however, repair the vast majority of imperfections successfully; any imperfections that remain are intentionally left to preserve the state of such historical works.